Map maker : ILJIN, A.. Date : St. Petersburg, c.1905. Size : 7.0 x 11.0 inches. / 17.7 x 28.0 cm. 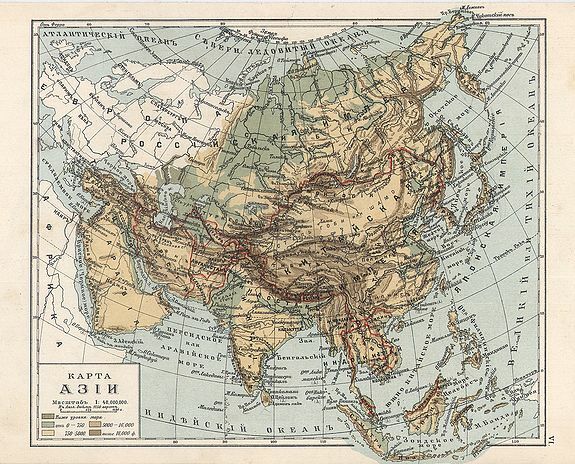 Description :A more than 100 year old Russian map of the Asian continent printed in lithography. Published by one of the most successful publishers of St. Petersburg A.Iljin. With a colour key to evaluations. All names in Russian characters. On verso part of the European Russia. Condition : Lithography in colours. Good condition.